The Cast of "Little Shop of Horrors"
Beware all living things: Little Shop of Horrors is back (at Trinity Rep in Providence), with a vengeance, as it was some years ago when another local company presented it. Now as then, attend the tale of Audrey II. She’s green and mean, this cousin of the Venus fly trap. A true pistil-packing momma, she’s the horticultural star of this former off-Broadway hit (of the 1982 season, with a five year run, winning the New York Drama Critics and Outer Circle Critics Best Musical Awards), based on a much-beloved, campy cult black and white 1960 film by Director Roger Corman (the king of the low-budget B movies) and Screenwriter Charles Griffith. It ultimately became a 1986 film musical, and was revived on Broadway in 2003. Most prophetically, it was the first mega success of novice creators Alan Menken (score) and the late Howard Ashman (book and lyrics), who would go on to “The Little Mermaid” and “Beauty and the Beast”. Perhaps you’ve heard of them. Rebecca Gibel & Jude Sandy in "Little Shop of Horrors"
“Little Shop”, only their second work together, was a loving tribute in farce to the horror movie genre, spoofing 60’s rock and roll, doo-wop, and Motown sound, television sitcoms, and several other targets. Ashman’s book and lyrics were filled with intentionally outrageous puns (for example, referring to the character of a sadistic dentist as the “leader of the plaque”). Some of his other references (“Father Knows Best”, “The Donna Reed Show”, “December Bride” and even “Howdy Doody”) may not resonate with younger audience members today, but most of their fang-in-cheek humor is timeless, if treated with affection in the right hands. 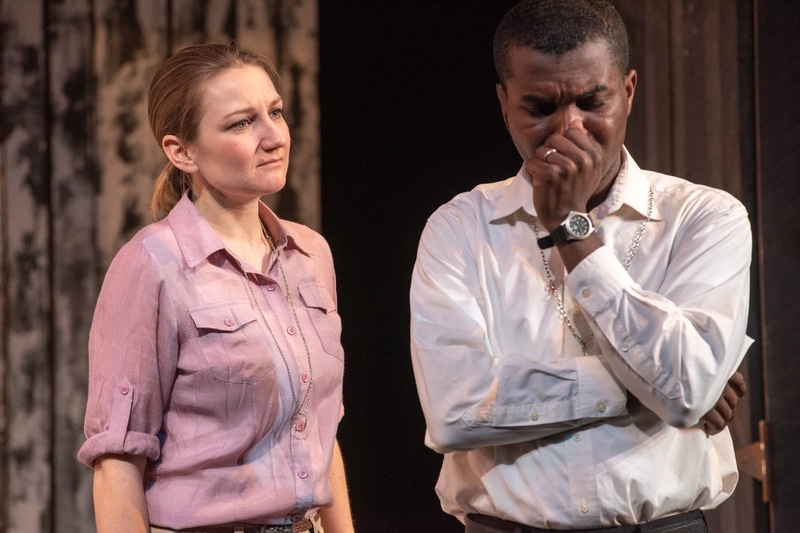 One feared the worst when hearing Director Tyler Dobrowsky decided to set the story not in Skid Row in New York but in 1960's Providence “because...Rhode Islanders like to see themselves on stage” and have an “optimistic underdog identity”. That said, there were just a few such references (for example, calling out Cranston) which didn't affect the story much. Which may have worked. His respect for this work shows in his faithful treatment, balanced with a considerable number of original and imaginative touches, such as a visual homage to a famous blonde. He's aided by the Music Direction by Esther Zabinski, with the usual superb technical credits: Scenic Designer Sara Brown, colorful Costume Designer Andrew Jean, Sound Designer Peter Sasha Hurowitz (which needs to be adjusted when solos are involved) and Lighting Designer Dan Scully, not to mention the Choreography by yon Tande. 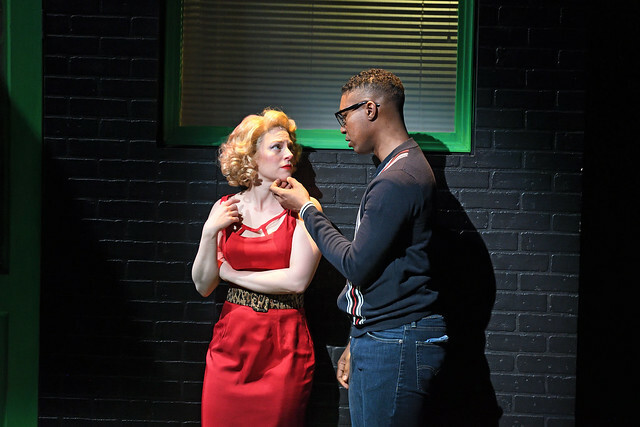 Ted Chylack & Rebecca Gibel in "Little Shop of Horrors"
Ah, and that cast. Seymour (Jude Sandy) is the ultimate nerd working in a struggling flower shop; his innocent mimicking of his co-worker Audrey’s accent (living in “the guttah”) is a hoot. Rebecca Gibel plays Audrey (the part played so memorably by Ellen Greene in both the original production and the film musical) with the perfect tone of the clueless bimbo with her boyfriend Orin the Dentist (Stephen Thorne). Thorne was a real standout though the dental segment went on a bit, becoming way too long in the tooth. Other standouts were the three “urchins”, Chiffon (Carla Martinez), Crystal (Elexis Morton), and Ronnette (Kedren Spencer), a sort of Greek chorus. Also on hand was Mr. Mushnik, the owner of the flower shop (Stephen Berenson). And then there was “Audrey II” (in the largest mistep, wierdly using a live actor, Rachel Warren, who felt like the lead character in “Spider Woman”, nearly ruining the balance of the sweet and sour story, rather than just having Ted Chylack as the puppeteer), thus also losing the hilarious touch by the original authors' depiction of a “female” plant voiced by a deep bass. There was also an Ensemble of street people (Timothy Crowe and Janice Duclos among them). And there's that unforgettable villain’s cry, “Feed me!”, oxymoronically, from a hysterically hammy plant. 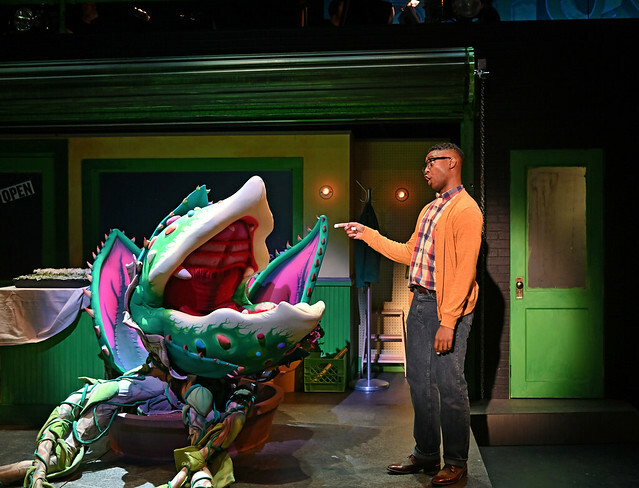 How “Audrey II” miraculously appears, unites Seymour and Audrey, grows, and forever changes the lives of most of the cast, is best left for audience members to discover. Suffice it to say that Gibel alone is worth the price of admission; her Audrey is plain priceless. Ted Chylack & Jude Sandy in "Little Shop of Horrors"
The Cast of "Trigger Warning"
At the close of its eighteenth season, it was entirely fitting that the play Trigger Warning be the ultimate closer for Zeitgeist Stage Company, the scrappy “fringe” theater that was renowned for its courageous, often in-your face productions. The term zeitgeist typically is used to denote “the defining spirit or mood of a particular period of history as shown by the ideals and beliefs of the time”, or as “the general intellectual, moral and cultural climate of an era”. Such indeed was the valiant company founded by its Producing Artistic Director, David Miller. And such were the theme and import of this important contribution to the discussion of gun control in our country. It was decidedly with mixed emotions that one entered the Black Box Theatre in the Boston Center for the Arts in the South End. There was the ever-present excitement about seeing a brand new play such as Trigger Warning which was not only a world premiere, but a piece that was actually commissioned by Zeitgeist Theatre. At the same time it was with profound sadness that one realized that this was to be the final curtain for the company that has been a fascinating entity providing theatrical works on the edge, always under the careful eye of its founder and frequent director, David Miller. 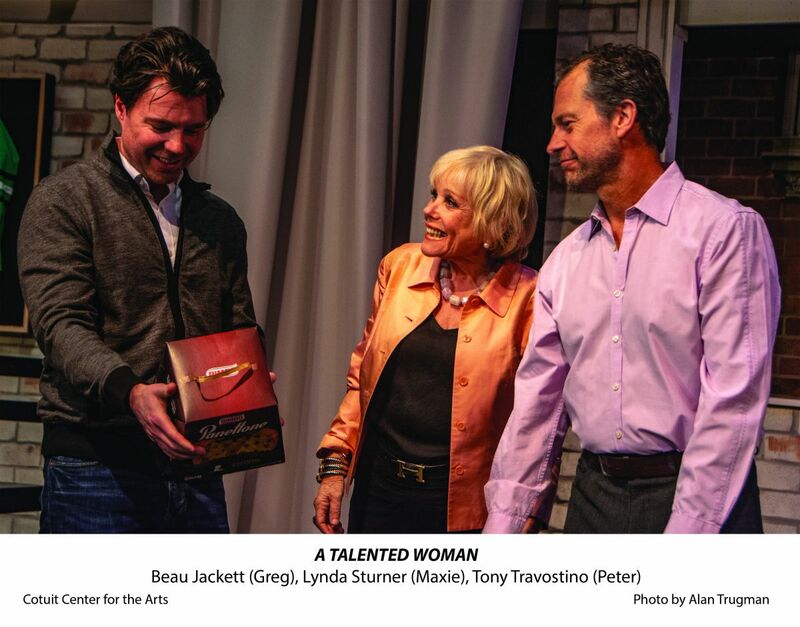 This current production was in that same vein, an original work by Connecticut resident playwright Jacques Lamarre. The playwright lives in close proximity to the sites of three mass shootings, and here displays how such mass shootings may affect the family of a shooter and their concern about whether they missed any signs or ignored them, whether they could have done anything to prevent the slaughter by one of their own. 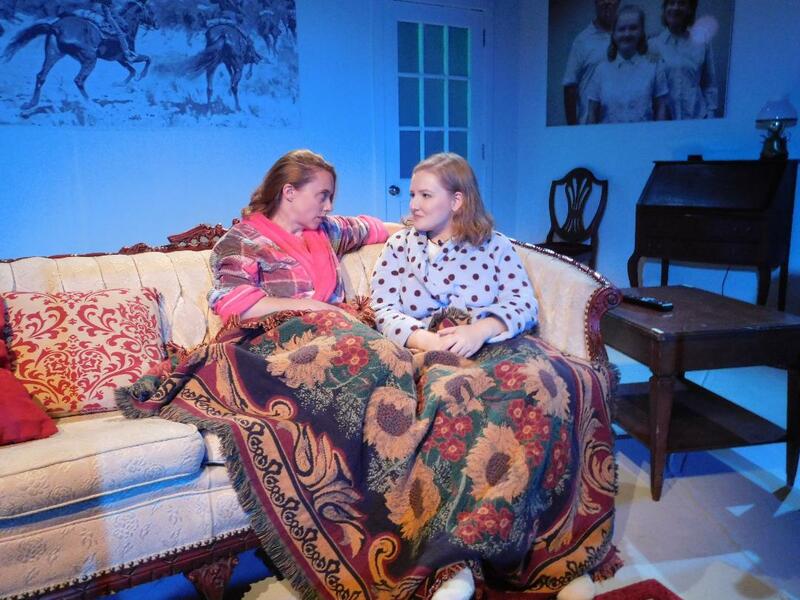 Kelley Estes & Lilly Brenneman in "Trigger Warning"
In ninety intermission-less minutes, Lamarre presents a high school mass shooting in which a teenager killed more than fifty people, then himself. This is as much as one might say about the play without spoiling the gradual messages it reveals about such issues of gun control, brain science, parenting, mental health and community. In the course of such a brief work about a subject that is intensely written and performed, there isn't much room for subtlety. We meet the family members virtually immediately as they have just learned of the tragedy, from the gun-loving father Murph (Steve Auger) to the control freak of a mother Jackie (Liz Adams) to their daughter Meghan (Lilly Brenneman). Also affected are Jackie's sister Amy (Kelley Estes), their friend Attorney Bates (Holly Newman) and FBI Agent Pelletier and Reverend Tracy (both played by Naeemah A. White-Peppers). All struggle to find some reason for such an unreasonable act, and, most significantly, whom to blame. Is it the father, conveniently a gun safety instructor for the NRA who calmly states, regarding his treasured gun collection, “guns are family”? Is it the realtor mother who seems to have more connection with her Alexis disembodied voice than with her family's cries for help and attention? Is it the victimized younger sibling who morphs into what her mother derides as “Jane Fonda”? Wisely, Lamarre doesn't provide easy answers, presenting the problem from an overlooked perspective. In this he's greatly helped by an essential scene in which the talented Brenneman displays the complex and complicated feelings underlying the inaction reaction in our country. 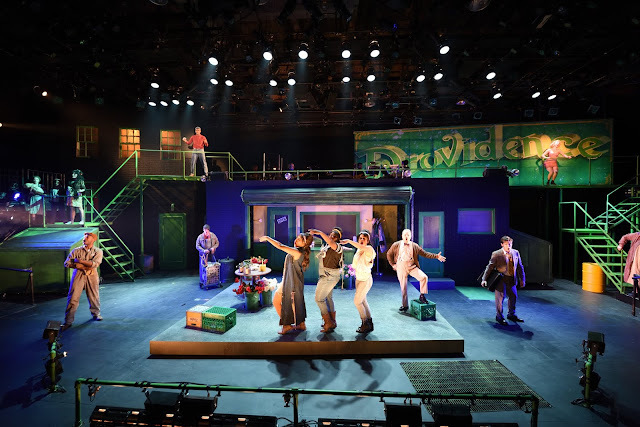 Other crucial parts of the puzzle are aided by the Scenic and Projection Design by Michael Flowers, Lighting Design by Michael Clark Wonson, Sound Design by Jay Mobley and Costume Design by Elizabeth Cole Sheehan. 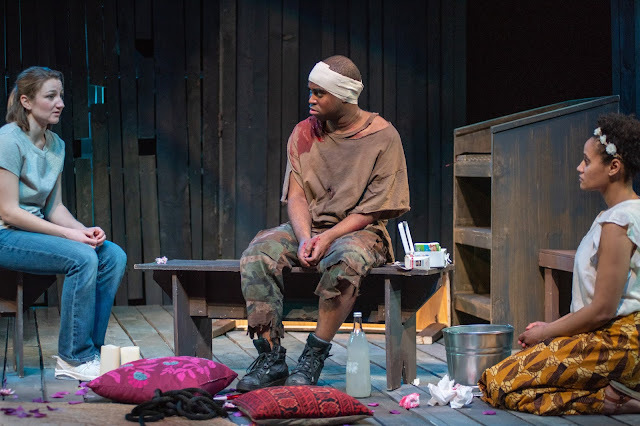 And, while some of the acting was uneven, the play's concept and its execution, and the underlying insanity of easy access to warlike firearms, are just beginning to be paid attention. And, as another playwright might put it, and be correct in applying the exhortation to David Miller, “attention must be paid to such a man”. Perhaps it's too little too late, but some of us have always admired his direction, his drive, and his dedication. You may experience all of the above just one more time, through May 4th. 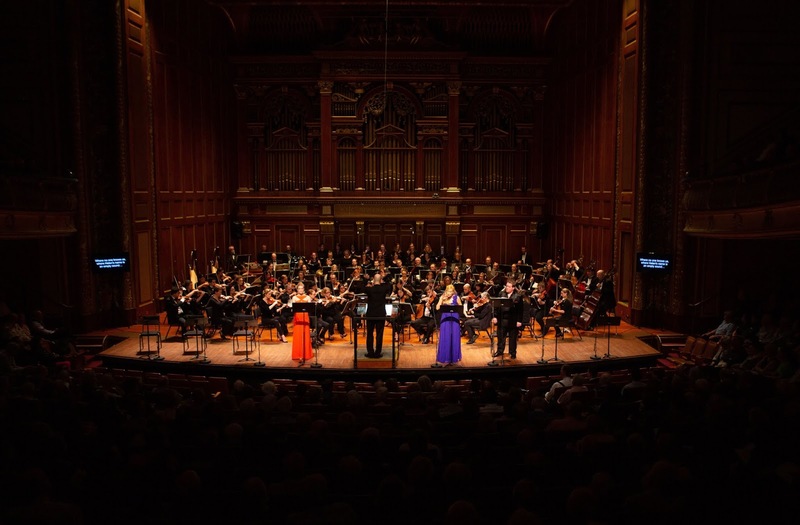 True to its six-season history, the adventurous Odyssey Opera recently produced yet another Boston premiere, this time the sublime Die Agyptische Helena, composed by Richard Strauss with a libretto by his frequent partner Hugo von Hofmannsthal. When it comes to operatic works by Strauss, one doesn't expect a brief chamber piece, and this one was no exception, running just shy of three hours, with a chorus of almost thirty singers and an orchestra of nearly a hundred players. Based on Euripides' Helen, performed in a concert version in German, with English supertitles by Christopher Bergen, the opera is, in the words of Odyssey Opera's General and Artistic Director Gil Rose, about “love lost and painstakingly re-won”. A relatively little-known romantic work, it's a tale of desire and jealousy, first seen and heard in Dresden in 1928. Given the extraordinary score and performance this past Friday, this cried out to be heard in what was perhaps the high point in concert productions this season, despite a rather incredible libretto; it was Strauss at his finest, if not best-known, truly a hit, not a myth. The romantic story takes place right after the end of the Trojan War, in the (mythological) past when Helen (soprano Kirsten Chambers), having first eloped with Paris, is returning to Sparta with her husband Menelas (tenor Clay Hilley), when their ship is blown off course to the magical island belonging to the enchantress Aithra (soprano Katrina Galka), accompanied by her First Servant (Sara Duchovnay) and Second Servant (Erica Brookhyser). Aithra, through her oracle, a mussel known as the Omniscient Sea Shell (contralto Joyce Castle), learned of Menelas' intention to kill Helen for her infidelity and deliberately washed them ashore so that she could convince Menelas that it was a phantom form of Helen who had fled with Paris. 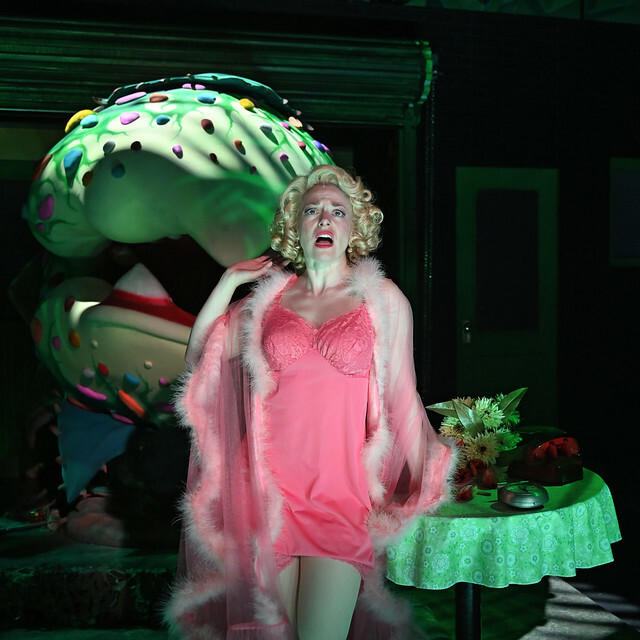 The first act of the opera is surprisingly light and humorous for such a dark take on this tale, but the second act is significantly more philosophical and serious. Helen hails their second wedding night as Menelas wonders if she was an illusion, when suddenly the mountain prince Altair (baritone Ryne Cherry) and his son Da-ud (tenor Won Whi Choi) arrive. They bring gifts and urge Menelas to join them on a hunt. In a stupor, Menelas, thinking Da-ud is Paris, kills him. Escorted by Helen's daughter Hermione (soprano Leah Kazuko), Menelas drinks a potion to restore his memory, forgives Helen and thus reunites his fractured family. The role of Menelas is a demanding one, to say the least, and audiences clearly felt Hilley was up to the task with his Wagnerian power; the same could be said for the role of Helen as sung by Chambers (last seen locally as the Infanta in Odyssey Opera's production of Zemlinsky's Der Zwerg) and Galka, not to mention the brief but memorable delight of hearing Castle (in the fiftieth year of her singing career). Add to these artists the conducting skills of Maestro Rose and the expertise of the Odyssey Opera Orchestra and Chorus, and this was a Helen to remember. 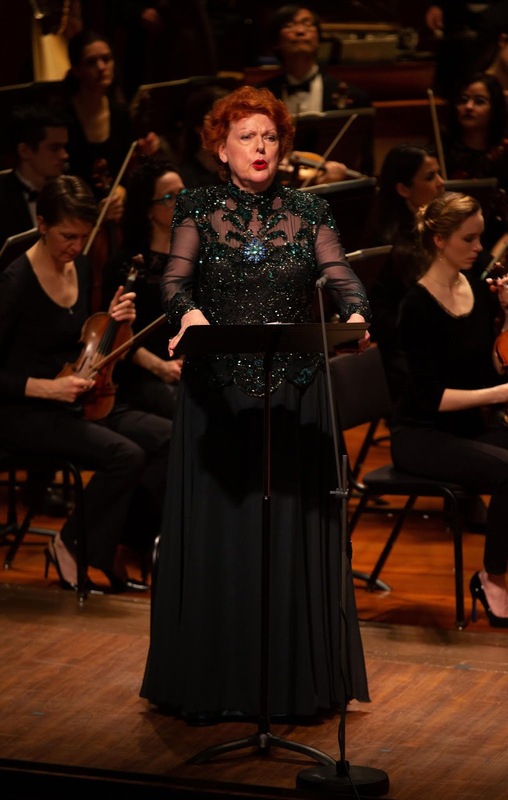 The concert was presented on one night only, Friday April 18th at Jordan Hall, to be followed in mid-June by the company's third tribute to Helen, Offenbach's La Belle Helene, fully staged and sung in English, at Huntington Avenue Theatre. That's a heck of a lot of Helen, but well worth a few thousand ships, more or less. As Rose succinctly puts it, omnia vincit amor! Mention the name of Venezuelan-born Conductor Gustavo Dudamel and immediately the name of Disney (Hall) in Los Angeles comes to mind, where, as music director of the L A. Philharmonic, he most often accomplishes the magic he and the late Walt both share. (He is also the principal conductor of the Gottenburg Symphony in Sweden). When it was first announced that he would be coming to conduct the BSO this spring, audiences were eager to learn what repertoire the wunderkind would be including for his much-in-demand visit in these parts. Given the time of year, what could possibly be more appropriate and timely than a program that features two seasonally inspired masterworks, Robert Schumann's Symphony No.1 (“Spring”) and Igor Stravinsky's The Rite of Spring? And how clever was it to balance diametrically opposed portrayals of the birth of the season, one vernal, the other infernal? Schumann's Symphony No.1 in B-flat, Opus 38, heard the sound of daybreak in March 1841 after a swift (less than a month) spell of first sketching and then composing, conducted in Leipzig by none other than Felix Mendelssohn, with the Gewandhaus Orchestra. 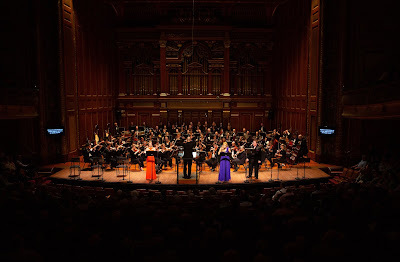 As is mentioned in the BSO program notes, it was a time when a cornucopia of compositions in European music included such composers as Berlioz, Chopin, Liszt, Verdi, Wagner and Mendelsshon, finally forming in music for the first time an intentional reflection of the Romantic Movement so prevalent at the time in the other arts. Beethoven's music influenced the Romantic composers' new styles with its freedom to put aside the conventional narrative using a more structured and confined form. Still, Schumann produced an orchestral sonority, which later writers found overly composed and thick, and which may have reflected the eventual view of the entire era rather than a critique of the composer himself. In the case of his “Spring” work, it can be heard as a wake-up call that mankind (and womankind) encounter every spring, each time as though it were the first. Schumann based this piece on two Bottger poems, first identifying segments by name, a practice he eventually dropped. His dominating methodology was restating and expanding motifs; in this symphony his independent poetic codas balanced by an operatic finale seem to be aimed toward each listener independently. Sadly this was mirrored in the intensity in his life which ultimately led to madness and final days in an asylum. Igor Fedorovich Stravinsky's Le Sacre du printemps or The Rite of Spring was commissioned by none other than famed impresario Sergei Diaghilev and first performed in Paris by the Russian Ballet in 1913. The first BSO performance was not until 1924. It was not Stravinsky's first composition for Diaghilev, as he had had great success already with The Firebird and Petrushka (the latter to be played next month by the BSO under Andris Nelsons). But this was such a radical departure, in so many departments, that it literally shocked his audiences, not least with its violent vision of the arrival of spring, which he had based on an old Russian pagan ritual in which a village of elders stood by as a young girl in fertility rites danced herself to death. In its first half, after the famed entry of solo bassoon (here beautifully delivered by Richard Svoboda) there was the ritual of sacrifice, expressed primarily in dance and accompanying music, with a heavy influence from folk songs borrowed from traditional culture, really not a theft of the songs but more of a transformation of the genre. With rhythms and accents intentionally misplaced, shifting meters, and raw energy, it so upset some first-time hearers that it caused an infamous riot. Some short-sighted patrons at the time were repulsed by its seeming attack on the traditions of the arts, but it would come to be seen as an attempt to convey what art was capable of creating and how that may be communicated. It's rightfully recognized today as a milestone in the history of musical composition. Still, even today, it sounds as though it were written tomorrow. Dudamel displayed familiarity with both works and worked his magic well (even with the parts of Stravinsky's work that long ago found their way into Disney's movie Fantasia). The BSO was equally at home with the program. Both pieces, especially the Stravinsky, demand a leader who is vigorous, decisive and completely in charge, and Dudamel fit the bill on all these prerequisites. The BSO has performed these works under seventeen conductors in the past, surely rarely so rapturously received. T. S. Elliott famously referred to April as the cruelest month, and this was reflected in both works, in particular in The Rite of Spring, definitely not a piece for the faint of hearing. This program will be repeated Tuesday April 9th though under Conductor Ken-David Masur, as Maestro Dudamel has had to withdraw due to an injury. Rachel Cognata & Marge Dunn in "Cardboard Piano"
Cardboard Piano by South Korean playwright Hansol Jung, the current production by New Rep Watertown in its New England premiere, is set in its first act in Northern Uganda at the turn of the millennium (facts not noted in the program but only gradually revealed in the course of the performance). It begins with a meeting of a local Ugandan girl, Adiel (Rachel Cognata) and Chris (Marge Dunn), the daughter of American missionaries. Both are teenagers (though the actresses who portray them obviously are not), whose lesbian love story has developed in secret during the growing civil war. Just as they have completed their vows in their private ceremony, they are interrupted by the arrival of an escaping child soldier Pika (Marc Pierre) and a gun-bearing Soldier (Michael Ofori) hunting him. The first act ends tragically, though predictably. Michael Ofori in "Cardboard Piano"
The second act takes place some fifteen years later in the same locale (again no program note reveals this); several of the characters are eventually shown to be connected to one another, namely a subsequent pastor, Paul (Ofori again) and his wife Ruth (Cognata again) as well as a young gay congregant, Francis (Pierre again). 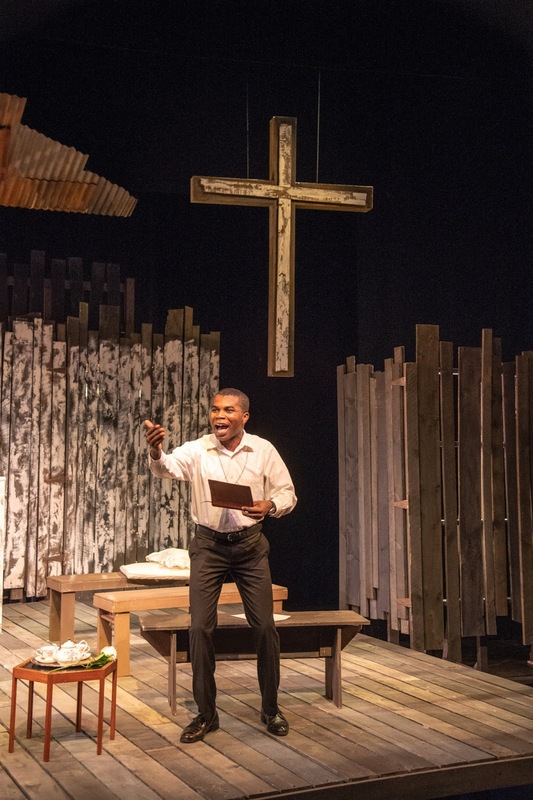 As the play winds down, we are presented with the fact that there still exist deep roots of hate and bigotry, especially with regard to homophobia, while we also experience the discovery of the power of forgiveness. That's about as specific as one can be without giving away some crucial plot points. Marge Dunn, Marc Pierre & Rachel Cognata in "Cardboard Piano"
The arc of the play, over two hours, needs some fine tuning, especially to engage sooner with the audience, as the characters and their issues are revealed. As Directed by Benny Sato Ambush, the four actors who comprise the entire cast manage with varying degrees of success to convey their conflicts. Of the seven roles portrayed in this mounting, the most memorable is that of Cognata's depiction of Ruth, who ably expresses her growing realization of what has occurred in the past that is so profoundly echoed in the present. 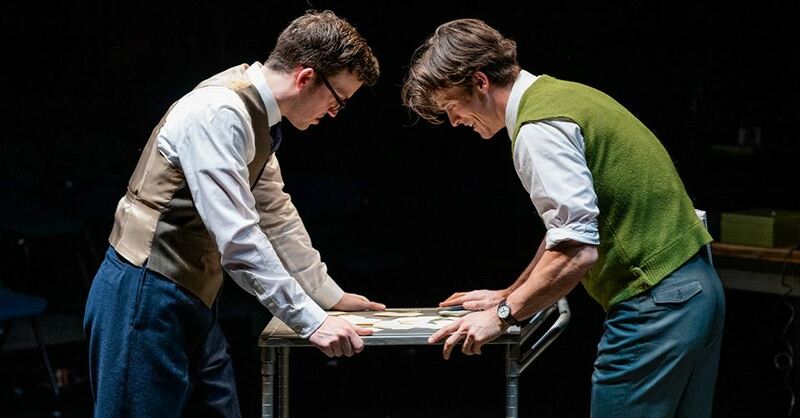 With respect to the creative team's contributions, the clever Scenic Design is by Jon Savage, with Costume Design by Leslie Held, Lighting Design by Scott Pinkney and Sound Design by Dewey Dellay. Marge Dunn & Michael Ofori in "Cardboard Piano"
Though occasionally encumbered by what might be viewed as rookie missteps for this young playwright (whose thesis project at Yale School of Drama was this work), there are important spiritual crises dealt with here. It's unfortunate that they are at least in part diminished by some coincidences that skirt the parameters of credulity. Whatever its shortcomings, it asks a few fundamental questions, one of which Director Sato Ambush demands in his own program notes: “What kind of God believes some of His creation are born wrong”? Stacy Fischer in "Photograph 51"
“I love the shapes of things”. So spoke British scientist Rosalind Franklin. That statement expressed in concrete terms her focus on determining the form that would become known as the deoxyribonucleic acid molecule's double helix, otherwise known by us mere mortals as DNA. The year was 1952, a watershed date in the development of modern science's discovery of the existence and shape of DNA. That eureka moment led to the awarding of the Nobel Prize for its discoverers. Or did it? Three male scientists were granted the award, ignoring the demonstrable fact that their claim to have been the first and only discoverers was a sham, given the role of one female scientist, the completely overlooked British biophysicist Franklin. In a word, she was robbed. 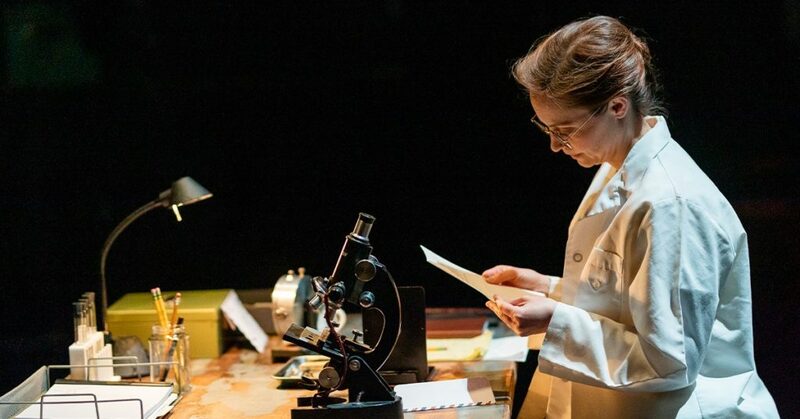 How that gradually, insidiously, inevitably happened is the crux of the current offering at Central Square Theatre, Photograph 51 by playwright Anna Zeigler. As the character of Franklin herself says in the play, “we see everything except sometimes what is right in front of us”. And for not taking that leap as opposed to more deliberate study, she was ignored. 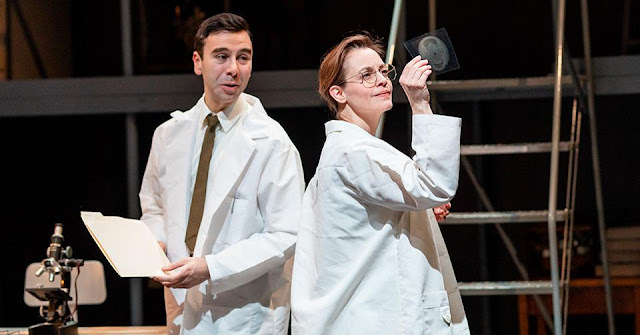 Josh Gluck & Stacy Fischer in "Photograph 51"
It was Zeigler's intention to right that wrong, at long last. 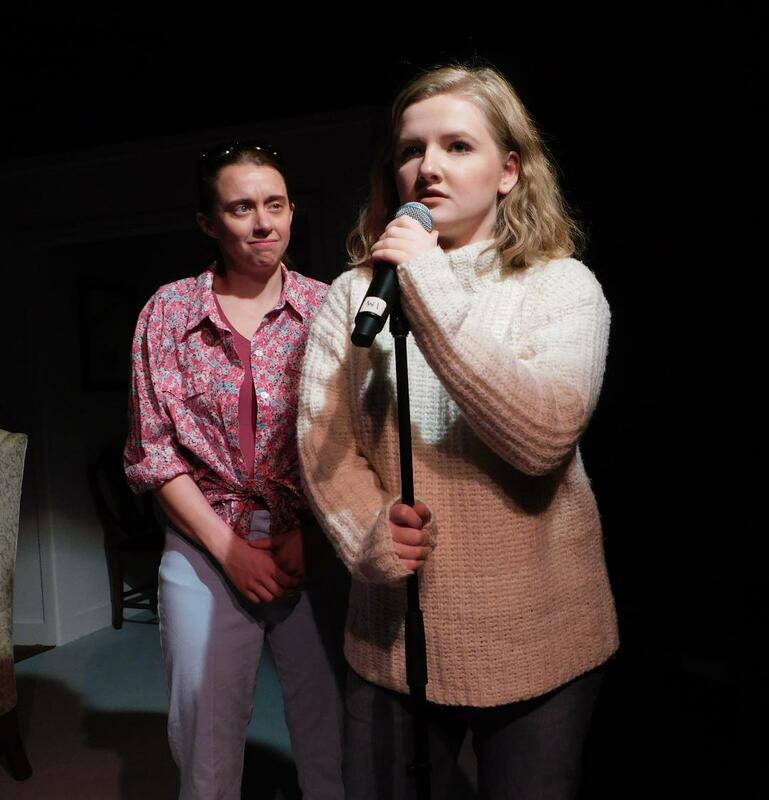 Now, in its thirtieth season, along with commemorating Central Stage Theatre's tenth anniversary, Nora Theatre has mounted the play, with all of its timeliness intact and then some. It's also a production of the Catalyst Collaborative @ MIT. Interestingly, it's the second time Nora Theatre has presented this play (the first was only six years ago). The title refers to the x-ray diffraction image, known as photo 51, at King's College in London. The female biophysicist (an x-ray crystallographer, if you must know) was Rosalind Franklin (Stacy Fischer). The three male doctors were Francis Crick (John Tracey), James Watson (Michael Underhill) and Maurice Wilkins (Barlow Adamson). Donald Caspar (Jesse Hinson) and Raymond Gosling (Josh Gluck) also play supporting roles. All are integral to this presentation, with a special nod to “colleagues” Fisher and Adamson, the Greek chorus role by Gluck, and the appropriately energetic turn by Underhill. John Tracey & Michael Underhill in "Photograph 51"
The character of Franklin isn't softened in the play from what it would appear to have been in life, keeping her from standing out, what with the blatant misogyny that surrounded her and led to one of history's worst examples of unfairness and unconscionable chauvinism. Most frustrating is that we will never know whether Franklin would have made the leap to the explanation if she hadn't been marginalized; would she have taken the risk? 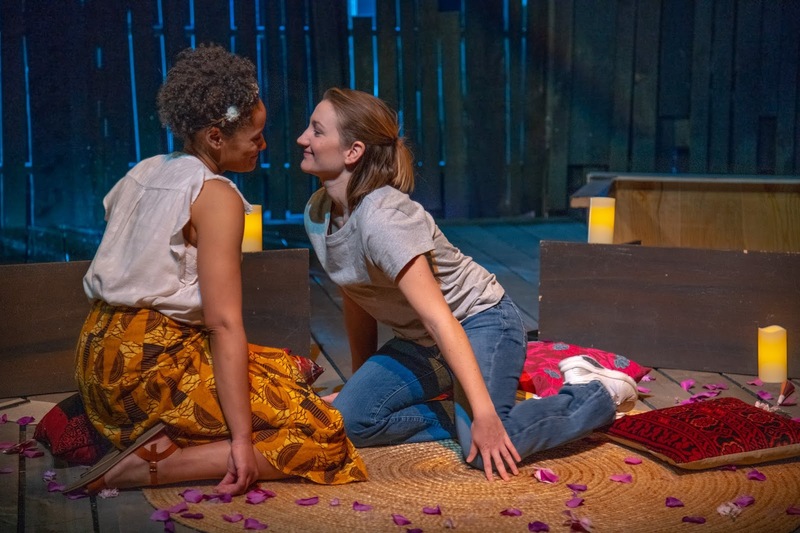 As aptly Directed by Rebecca Bradshaw, with Scenic Design by Kristin Loeffler, Costume Design by Chelsea Kerl, Lighting Design by Aja M. Jackson and Sound Design by Elizabeth Cahill, this current production doesn't attempt to answer this. (Those who have been paying attention might note that's an ironically all-female creative team; one might also ask why we noticed that). With a length of just ninety intermission-less minutes, the time seemed to fly by in this remarkable retelling of a critical moment in the herstory of medical science. What doesn't fly by is the excruciating feeling that you've seen this sort of thing happen, either covertly or overtly, virtually every day of your life, and it doesn't seem to be getting any better anytime soon. In Franklin's time, she was habitually addressed as “Miss” rather than “Doctor”, and not even allowed to eat with her male colleagues. Times may have changed somewhat, but not completely. Given the current state of the disunion, maybe theater is our last resort. One can only hope that diversity overcomes perversity, and that our scientific and theatrical heroes continue, virtually every day, to look at lot more like us. 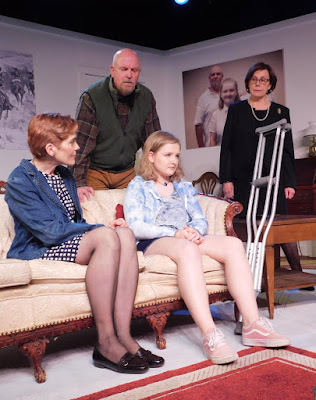 The title of the current production at Cotuit Center for the Arts (a.k.a. CCftA) is a double misnomer: A Talented Woman, a Sophisticated Comedy; it could also be a misleading one. The term “comedy”, it quickly proves, is more in the Shakespearean sense, that is, a play that doesn't end tragically. Whether the woman (or, more precisely, women) and a perceived “talent” belong in the same sentence depends on how broadly one views the strengths (and weaknesses) of the three female leads. 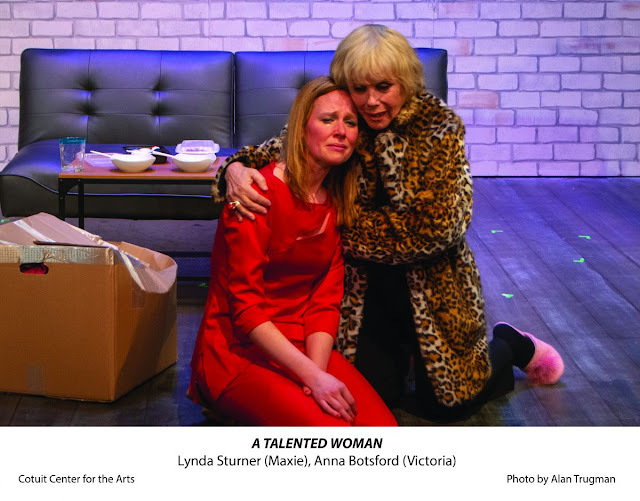 The work, co-written by Lynda Sturner and Jim Dalglish, has already received accolades (notably the Winner of the New Playwright, New Plays Competition and the Kaplan Prize). Still, it's a stunning shift of tone for Dalglish fans (he's the author of such serious previous plays at CCftA as “Unsafe” and “Lines in the Sand”). 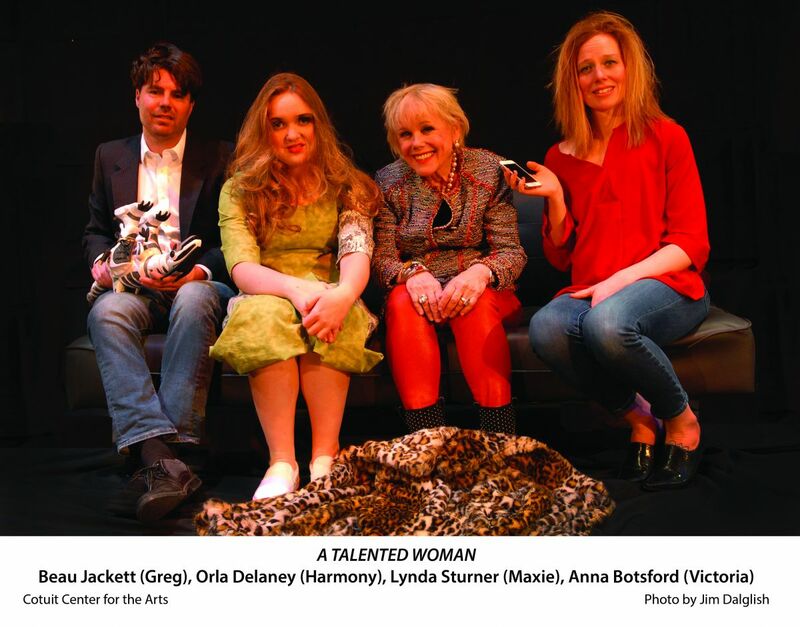 The intergenerational relationships on view display a collective talent for dysfunction, and individually the three women share a talent for self-absorption that's far from pleasant, with a focus not on their talents so much as their bared talons. The story features three women at various stages of life, living in New York City during the Great Recession: Maxie (co-author Sturner) is a grandmother, recently widowed, who faces imminent financial ruin; her daughter Victoria (Anna Botsford) a workaholic struggling to balance her personal and professional lives: and Maxie's precocious teenage granddaughter, Harmony (Orla Delaney), a name that is slyly ironic in this context. Also in the cast are Peter (Tony Travostino) as Maxie's man toy, Victoria's husband Greg (Beau Jackett) and corporate head-hunter Christopher (Ian Ryan). Some of the cleverest lines (“I've got you right where I want me”, “you have the maternal instincts of a Waring blender”) are actually given to the male performers, though their characters (except, eventually, Greg) aren't as well developed. The women each prove to have a particular talent: Maxie, for shopping beyond her means, Victoria for being compulsive, and Harmony for rebelliousness. Since this work is Directed by Dalglish and stars Sturner in one of the key roles, there is an inherent danger in not being able to assess one's output objectively. Fortunately the route they have taken via readings and workshops has enabled them to hone their story to its current form. The complex Set Design by Glenn Bassett, Score and Sound Design by J. Hagenbuckle, Lighting Design by Greg Hamm and Costume Design by Tami Trask are all indicative of superb theatrical talent behind the scenes. Attention should also be paid to the Stage Crew who manage to pull off quite impressively the complicated scenic changes. It's always a promising event when a regional company presents, as in this case, a world premiere of a playwright or playwrights (speaking of talent), and indicative of the ongoing commitment of CCftA to the local theatrical community.